Using a common cold virus – adenovirus – as a foundation, researchers at the University of Pittsburgh say they have created a H5N1 (bird flu) vaccine that has so far proven to be 100 percent successful in animal tests. The results were announced yesterday ahead of publication in the Journal of Virology. The vaccine was constructed by genetically engineering a common cold virus, called adenovirus, to express either all or parts of an avian influenza protein called hemagglutinin (HA) on its surface. Found on the surface of all influenza viruses, HA allows the virus to attach to the cell that is being infected and is critical to the influenza virus’ ability to cause severe illness and death. The researchers constructed several adenovirus “vectors” – viruses that have been modified to serve as delivery vehicle for foreign genes or DNA – containing either the full genetic sequence of the HA protein or sequences for only subunits of HA. The researchers then tested these slightly different vaccines by comparing their performance to an adenovirus vector containing no H5N1 genes (an empty vector). All of the mice immunized with the empty vector vaccine were dead within six to nine days of avian flu exposure but most of the mice immunized with the adenovirus containing either the whole or part of the HA protein showed only mild and short-lived weight loss and survived H5N1 infection. 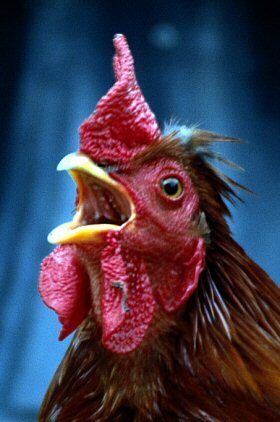 The differences in immune response to H5N1 were quite profound, said the researchers. Although they were able to isolate high levels of infectious H5N1 from multiple organs in the mice vaccinated with the empty vector, and to various degrees in animals vaccinated with the vectors containing the HA subunits, they isolated only very small amounts of H5N1 from the mice immunized with the full-length HA vaccine three days after infection. Six days after infection, they could not detect any infectious H5N1 in the organs of mice immunized with the full-length HA vaccine. The researchers speculate that because the vaccine contains a live virus, it may be more immune-activating than avian flu vaccines prepared by traditional methods. “The ability of this particular recombinant vaccine to induce both antibody and T cell directed immunity is extremely encouraging,” said co-researcher Simon Barratt-Boyes. “This means that this recombinant vaccine can stimulate several lines of defense against the H5N1 virus, giving it greater therapeutic value. More importantly, it suggests that even if H5N1 mutates, the vaccine is still likely to be effective against it. How effective, we are not sure. We won’t know until that occurs,” he added. Further experiments with chickens confirmed the vaccine’s effectiveness although it appeared that intranasal inoculation was less effective than subcutaneous injections. The researchers are still not yet sure why the subcutaneous delivery is more effective than the intranasal delivery of the vaccine, but they speculated that it may be because the adenovirus vector they used has limited infectivity via the nose and respiratory tract.